If you've done any research at all, you've probably already realized that getting into the credit card processing field can be extremely profitable. Just about every serious business needs a merchant account, so the number of prospects that you could work with are countless and the market is ever-expanding as the economy recovers. Are you looking for a good affiliate program with a merchant services company? Becoming an affiliate means that you can help promote the great products and services at Shaw Merchant Group and receive a commission for what you help us earn from each lead. If you already have a popular website or other platform, then affiliate marketing may be a great way to monetize your audience. We're as dedicated to our affiliates as we are to our agents, so we won't just give you an affiliate link and send you on your way; we offer tools that can help you attain true success. So why not give your customers exactly what they need—a great merchant account solution—while earning money in the process? Why is Shaw Merchant Group a great partner for your affiliate marketing venture? Why not sign up today? Signing up with us is free, so you have nothing to lose when you add Shaw Merchant Group to your arsenal of affiliate partners. We provide tons of analytics and accurate reporting of your conversions, and we pay you on time every month. Get into contact with us and start helping your audience by helping us sell our quality products. Ready to Grow Your Sub-Agent Network? Is all your hard work finally paying off and your business has grown too big for you to handle everything alone? Shaw Merchant Group can help you! With our simple recruitment program, we can have a new sales team of sub-agents trained and ready to bring you more sales and help your business expand to the level that it was meant to be. If you find that you're ready to recruit a team of agents but you don't know how to go about the process, get into contact with Shaw Merchant Group and we'll guide you towards your goals. If you have past sales experience, that's often a plus, but a lot of the time there can be aspects of your past that will give you a disadvantage. For example, if you used to sell mortgages, you didn't have to worry too much about creating a sense of urgency, since people were already a little desperate because their new house was on the line. It's not too different if you're selling the actual houses either; if someone has sought out a real estate agent, they're looking to buy. The same goes with selling cars, since many of the people who are coming to you really need a new one and can't go very long without transportation. Your job would be a lot harder if you had to go up to random people on the street—or worse, random people getting out of their cars in a parking garage—and ask them if they needed a new car. Sounds ridiculous? Well, this is basically what your life is like when you're selling merchant services. This is why the mindset is completely different in this field. Obviously, there are positive and negative aspects to this. Once you have convinced a merchant that he'd do better to change to your plan, making the actual deal is usually smooth. Just don't mess up, and you'll have a good closing rate. Another great aspect of this business is that once you convince a merchant that they need to change their processor, they will probably buy those services from you and not another random agent. This is all great, but unfortunately creating the sense of urgency that will get them to make a change is one of your biggest challenges. 1) More prospects = more sales. You are going to have to accept that you will have to deal with a much higher volume of prospects than in other fields to close a decent amount of deals. If you used to sell mortgages, for instance, your conversion rate is probably high—maybe as high as 1/3 of your prospects. A big reason as to why this is comes down to the fact that your clients already have decided what they want to buy and are coming to you for help. If you find a quality lead, the conversion rate is actually about the same when you're in merchant services, but the problem is that you will have to go through many people to find quality leads. You might walk into two dozen stores, but only find yourself able to talk to 20% of the owners, and only 10% of the stores you walked into had genuinely good prospects. A good prospect is someone who realizes that they could use your services and is eager to explore the options. This is why you shouldn't get discouraged if you find that you're having to visit tons of businesses just to make some progress. This is how the game is played. 2) Take it a step at a time. When you first make your pitch, you want them to reach a point of understanding that they need to make a change; don't rush them into make the full decision just yet. Your job at first is just to convince them that they would be better off with another service. Yes, you might be able to convince them of this and close the deal in the same session after you've had some practice, but these are still distinct steps. Just make sure that you don't make the assumption that the merchant wants a different processor—at the moment, they're probably not even thinking about it. You will have to convince them. The problem of course is that most merchants don't even think of this as a problem. They already put together their processing solution and they don't need to worry about it anymore, as far as they are concerned. They would rather put their attention elsewhere. How can you overcome that default resistance and make them open to the possibility of switching? Well, you should show them that you're not trying to throw a wrench in their plans or rip them off. Let them know that you are only showing them how much they could save if they reconsider, and that they can use your service if they want to. Try to focus on convincing them that they need to switch more than that they need to go with you specifically. Tell the client straight up that you are not interested in signing them up that day. They should be under the impression that you are interested in getting to know their needs better, and that you are merely opening them up to the cost-saving possibilities of finding a better credit card processor. Give them a Free Cash Gift – They may be a business owner, but chances are that they're pouring all of their personal resources into the business. It may not seem like much, but offering them something like a gift card or cash back when they make their account will certainly entice them. Make sure to start out letting them know that they won't have to pay any fees upfront if you work with a free terminal program or something similar, and then throw the free money on top of that to sweeten the deal. It doesn't have to be a huge amount of money—just 100 dollars will suffice—and you can easily take this out of your upfront signing bonus. Make it a point to mention this deal in your advertising. Basically, the merchant has nothing to lose here, and will actually make money upfront from the deal. Give them a free terminal – Believe it or not, there are still ISOs out there that do not offer free terminals with their deals. This can be for a number of reasons, but generally-speaking you want to steer clear of these companies when you're choosing a partner. Make sure that there is an option to offer a free terminal to the merchant, since this removes a major upfront cost. Much of the resistance that you will encounter has to do with these upfront costs and whether or not the merchant has the liquid cash to cover them. Bring a terminal in personally if you can to show them an example of what they can have for free. Tell them you're offering it temporarily. Guarantee Them Monthly Savings – You need to first consult with them and look at how much they pay in fees to pull this one off. Tell them that you can save them a certain amount of basis points per month of the competitors. Find out how much processing they do, and multiply it by however many basis points you are claiming to save them. Just make sure that you don't work with very large merchants here, or else it could cost you too much money. Once you have established how much they are going to save with you per month, make sure to zoom out and show them the big picture. Tell them how much they are going to save over the course of a year or two years. Discuss these big, long-term numbers instead of the tiny savings of 10 or 20 dollars that you might be able to pull off every month. These bigger numbers are certainly more motivating, and will get them to consider your offer much more readily, especially if some of the other offers above are included. Hopefully, these tips have enlightened you at least a little bit as to how you can create urgency in your prospects. Do you still have questions? Let us know! Contact us anytime and we will be happy to help you. Over time, the payment processing business and the Point of Sale business has slowly melded into one, thanks to customer demand for an all-in-one solution, and you may find yourself needing to offer this option to your own customers. POS terminals are easier to use these days than they were in the past, and most of your clients are going to be well familiar with the benefits that a good POS delivers over an old-fashioned cash register. If you give your clients the option of a POS solution, you'll be able to serve a more diverse range of customers, and even some very high volume accounts that will net you a decent profit in transaction fees. A merchant services company worth its salt will in turn have great free terminal offers that agents can pass on to the end users for no upfront cost. Since the providers of more of these terminals can essentially lock customers to one specific processor, it is hard to sell to merchants if you can't offer your own POS solution. This gives the merchants a way out without having to pay the upfront costs of getting a neutral terminal. You can basically eliminate a huge factor in a merchant's hesitation to switch over to your service. POS Benefits and Customer Loyalty – POS systems do so much more than just take people's money; they are an important part of keeping track of the business's logistical concerns, and the business owner likely uses its processes on a daily basis. For example, a POS will handle credit cards, but it can also handle employee time clocks, sales reports, inventory tracking, and other important analytics. Since a POS can be so important and simplify so many daily actions, business owners will be more hesitant to switch to other providers once you have them “hooked” on your particular POS and its familiar interface. The last thing that business owners are looking to do is fix something that isn't broken, so they are likely to stay with you over the long-term. This makes for a much more consistent portfolio. High Profit – Most merchants that are high volume, such as large restaurants and retail companies, must have a POS for all of its functions. Higher volume means more transaction fees, which means more profit for you. It would be harder to get these accounts if you could not offer your clients a POS solution. Better Margins – Sure, pitching lower rates to a merchant makes sense, and it may indeed convince them, but you'll have much more leverage if you throw a POS into the deal. You can also get away with charging more in fees this way because you're not focusing so much on competing at the price level. Bonuses – Depending on the merchant services company that you're working with, you may also receive a bonus for every terminal that you provide to a merchant, even if you offered it to them for free. Making Yourself the Better Option – When someone is a business owner, they want their life solutions to be as simple and easy as possible because they don't have time to mess around with the technology that they need to get the job done. Because of this, merchants are almost always going to prefer an all-in-one POS solution over just a simple credit card machine if they can get it for around the same price. By offering a POS, you are instantly making yourself a better option from other sales agents who are stuck in the past and aren't offering complete POS options. Setting Yourself Up for the Future – The future is trending towards full POS options for most merchants as costs continue to plummet. If you give your merchants a POS now, you are effectively insuring yourself against obsolescence. Your clients will be less likely to be seduced by other sales agent in the future, since they will have everything that they need for quite some time. POS Training – It might seem difficult to get started selling POS systems to your clients if you never have before, or if you consider yourself to be technophobic. Luckily, we offer training to get you up to speed. Just let us teach you, and you will know exactly what you're doing faster than you probably thought possible. All of our courses—which you can take in person or online—are free, by the way. The Basics of POS – Our first training course is an online one that you can take at your own pace, and that will show you the basics of how to sell POS systems to your merchants. You will learn the ins and outs of the software and the hardware, as well as all of the back-end features that your clients will enjoy. You will also learn all about the benefits of POS systems over traditional credit card terminals, and you'll acquire plenty of material that you can use when you're persuading merchants to switch to your services. Webinars – When you are done with the basic course and are ready to get started selling, this doesn't suddenly mean that your education is done. Just as technology changes, your knowledge about these terminals will have to evolve as well, so you would do well to learn as much as you can about these terminals. It will help you understand them better and offer good customer support. Join us regularly and we will give you all the latest updates on what you need to know. Become an expert with us! Certification – If you feel that you want to expand your credentials even more, you can become certified with us. Visit our training center in person, and you can join our certification program. It involves a four-day class where you learn all about the different POS sub-types that we produce for merchants, and it will give you a very deep understanding of the products that you're selling. From there, you will become extremely prepared to sell POS systems to any kind of merchant and will be able to give professional-level demos to your clients. Optionally, you can become certified to install your own POS systems at your merchant's location. A True Merchant Service Company – We don't just offer POS systems; we offer just about any sort of solution that a merchant will ever need. From our free POS terminals, to our stand-alone credit card machines, to our free cash register, we have exactly what you're looking for to suit the specific needs of your specific clients. Our terminals are technologically advanced and ergonomic, and are extremely competitive in terms of functionality. Profitable Fee Schedule – You are in the business to make a profit, so you're going to want a Schedule A that will allow you to make the kind of money you need. Our Schedule A is quite competitive and we offer many other benefits to working with us. For example, you can receive very handsome sign-up bonuses through us, as well as a 75% residual split. We allow you to build custom solutions for your clients as well, so that you can be sure that you are giving them the best deal and that you are more likely to close. We offer lucrative buyouts to help you raise the capital that you need when you are growing, as well as ISO private label opportunities. Get in touch with us today if you want to learn more! 1) First of all, do you actually own your residuals for the life of you account? If not, then years of work on your part could just disappear literally overnight. You could have been working tirelessly to build up a huge portfolio, but it would all be down the toilet simply because you stopped selling for awhile. Many ISOs have these stipulations, where you're required to bring in new accounts every certain amount of time, or your residuals are lost. Does that sound fair to you? So many agents fall for this racket. Don't do this, no matter how much bigger your part of the split will be. Over the long-term, it's just not worth it. You're trying to build long-term passive income here, not turn your work in sales into an ordinary job—that's a waste of a great opportunity. Make sure you ask about this before you choose an ISO. Tell them to give you an exact play-by-play of what will happen if you decide to leave the business. If the answer is “You will lose your residuals,” then walk away. Also, if you can't sell your residuals, then reconsider as well, since this is an indication that you don't really own them. 2) Forget about the percentage of your split. This doesn't really mean anything. To illustrate this better, let's say you're playing monopoly and your friend wants one of your properties. He offers you 30% of his net worth for it. However, another player butts in and raises the stakes. He tells you that he'll give you 50% of his net worth. Finally, a third player screams over your other two arguing friends and declares that he'll give you 10% of all of his cash if you will sell him the property. How do you decide which deal to take? Well, obviously, you don't have enough information to make a good decision, do you? Before you know which deal is the best, you need to know the net worth of each of the players! After all, if Player 1 and Player 2 only have 100 monopoly dollars to give you, then you know that what they're offering is a raw deal if Player 3's net worth is 5000 dollars. Even with only 10% of that, it's far more than what the other two players were offering. The same goes with credit card processors. Ignore their bragging about how they will give you 70% or 80% or whatever inflated number. It doesn't actually mean anything unless you know how they calculate the profit in the first place. Always get some context for these numbers, or else they are just going to be completely useless to you. 3) Always keep an eye on costs and the fees that the processor is going to charge you, as this will have much more influence on your profit than the actual split. You can find out what these fees are by looking at the Schedule A that your credit card processor will provide for you. You will also need to ask yourself a few things when considering cost. For example, do they add basis points before they calculate the profit? What are they going to charge you for the transaction fee? Some processors give you a true interchange pass through, while others will mark up the fees a few basis points above interchange before they start to calculate the profit. With the former kind of processor, things are a bit more obvious. For example, if your transaction fees are $0.03 and you in turn set up your merchant's transaction fee as $0.09, the profit per transaction is $0.06. If you had a 50/50 split, then you would get half of that in the end. It's a case of simple arithmetic. However, if you're having to deal with a huge mark up of dozens of basis points first, a lot of that profit is lost, and even if you had a 90% split, it wouldn't be worth it. By the way, stay away from “buy rate” programs, as they don't offer you good deals. 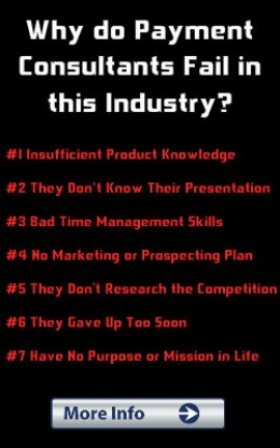 If you have any doubts about this, then be sure to get into contact with me and I will tell you all about it. You might be tempted to go with one of these programs, but I assure you that after I break it down for you, you will change your mind. Always go with a revenue sharing plan, as it's much more lucrative in the long run, especially if you choose a good processor to work with. I've even heard of processors trying to set up these kinds of deals with ISOs themselves, which is very silly in my view. You're trying to run a business here and build your empire, so don't settle for a buy rate. 4) The pricing is not as important as the cost structure when you want to get accounts of a significant size. Aim for a low cost structure for your clients. If your processor is charging more per transaction than $0.04, then you probably won't be able to pass on a reasonable deal to your merchants, so think twice about going with a processor that is this pricey, even if you're making 80% of the split. Make sure to have more than one partner so that you have access to the lowest rates and the best deals, and this way you can give your merchants a variety of options. This is especially true for your larger merchants. 5) Finally, keep in mind that you shouldn't get too caught up in either the cost structure or how much of a percentage of the residuals that you get. Ultimately, making the sales is what will determine your success in the long run. You need merchants to make money, and you need to close a lot of deals. Any ISO or processor that you're partnering with should know this and help you get the kind of training that will lead you down the right path. If you can't even close deals, then there's no point in worrying about your compensation—you won't be getting it anyway! Whether you make 50% or 90% of $0, it is still $0, and that's certainly not a handsome residual to be getting every month. So choose your associates wisely, as they can help you to succeed—or drag you down. We're happy to help you on your endeavor, so we offer all kinds of resources, from informative material, to help with your marketing, to training. If you're curious or have any questions about how to move forward in this career, then don't hesitate to send us an email. 1. Assume that the “yes” was already said. The point of your presentation is to show the merchant all the details, not to make a close. Why? They are listening to you, so they are probably already sold. Make that assumption, and you'll be less prone to pushy sales tactics that will turn them off. After all, why wouldn't they buy from you if you're giving them the best deal? 2. While you are going over the fees with the merchant, keep things simple. They really don't need to know all the dirty details, and honestly they probably don't care and will just get confused. Point to some of the main critical items and discuss those, but don't get long-winded unless they ask. When comparing yourself to your competitors, by the way, it will seem suspicious and dishonest to the merchant if you don't throw in one or two negative things about your plan—just make it obvious that the good things overwhelm them. 3. Show your merchant their long-term savings. Avoid focusing on what they will save per month, and instead bring up the big picture, such as what they will save in a year or two years. These big numbers are not only more impressive, they are also the ones that matter to their business ultimately. Explain your reasoning step by step as well, and how much you think they will save over the lifetime of the account. Bring up examples of what they could in turn invest that money in instead of credit card processing fees. Make the savings very concrete. Finally, when you close, ask if they have any questions. This puts the ball in their court and makes them feel like there is transparency and obviousness in the interaction. If they have no questions, it also lets you know that you have done what you need to do. 4. Now you're ready to get to the paperwork. This is one of the most critical periods in the presentation, since you are changing modes and making the deal into a reality. Because of this, you need to use something that won't intimidate the prospect. If you very obviously ruffle around for paperwork and contracts and the like, the merchant could start to over-think things because the situation is getting “official.” Instead, make a smooth, quick transition to the paperwork. In fact, have the paperwork already out (under the cost analysis material that you were presenting), and you don't have to worry about this transition at all. 5. Where you are more likely to meet resistance, of course, is when you have to input private information. Obviously, you don't know the merchant's bank account number or their SSN, and they probably don't want you to know it, either. In this case, give the merchant a pen and slide the paper towards them. Clearly indicate the section and have them fill it out, and always look away while they are writing the numbers. Don't make a show of it—just check your phone or something, or have some other polite excuse to not look at them until they are done. This private information is “inside” material, and people feel intimidated when “outsiders” get too close, so make it obvious that you're giving them space, or they may become hesitant, which is the last thing that you need. 6. Remember the follow up. When you successfully get them to sign, that's not the end of the story. You shouldn't suddenly abandon them just because you got what you wanted. Tell them that you're happy to work with them and ask them if they have any other questions. Stay with them for a bit to reassure them that their decision was the right one. Follow these guidelines and you should do fine on your first presentation. There are lots of reasons why building a merchant services business can be extremely lucrative, not the least of which is the fact that you can build a lasting asset (your residuals), which you can then sell. In fact, I spoke to someone in the industry today, and he was telling me all about his plan when he leaves the business and how he's planning to sell his residuals. What that conversation made me realize, though, is that lots of people underestimate the power of those residuals. The best thing you can do with this income is to use it as capital. 1) Own your portfolio's residuals. Maybe this seems very transparently obvious to you; after all, what's the point if you don't own your source of income? However, it's not uncommon that sales agents will lose their entire portfolio simply because they did not read the agreement that they made with their processor closely enough. You should always consider what might happen if you just decide to stop selling; if the answer is that you will lose your hard-earned residuals, then choose another partner. 2) Be able to sell your residuals. If you can't sell something, do you really own it, then? Sometimes processors will require you to have to consider an offer from them before selling to an outsider, and that's fine, but just make sure you are free to choose. 3) Find out if you can borrow cash against your residuals. A large ISO that isn't operating as a middle man should be able to lend you money. If they can't, this is a problem. Usually, you're going to want to exhaust several options before a buyout, and this includes borrowing. So let's assume you have all of these issues squared away and are the proud owner of a growing portfolio of accounts. Now you can start to use that asset to raise some capital! Do you qualify? Don't bother trying to pump any cash from your portfolio before you have at least two dozen accounts or so. Make sure that your accounts are making at least $1000 every month as well. You will be hard pressed to find anyone who would want to buy residuals less than this. Performing a buyout: When you perform an 100% upfront buyout, you'll get about 12 to 20 times the monthly worth of the accounts that you're selling. This is a rough estimate, but adjust your expectations accordingly. Performing an earn-out: Basically, this is the same as a buyout, except you get less upfront. Some of the money is upfront, and the rest is sent to you in increments with the stipulation that your accounts don't get canceled and that they continue brining in a certain amount of money. This will yield you more than a buyout in the long run—about 20 to 24 times your monthly income. Performing a secure buyout: Let's say you have a significantly-sized portfolio and you only want to sell some of your residuals. You can sell some of those accounts, and then use your others as collateral essentially to guarantee against any cancellations. This means less risk for the processor, so they are usually willing to pay more. Getting a loan: Maybe you just need to borrow some liquid cash and use your residuals as a guarantee. Most ISOs can do this for you. Usually, you can borrow anywhere from a few months to up to a year's worth of residuals. The terms will vary depending on your partner company. Since of course your ISO will be interested in minimizing risk, just show that you are using the funds to grow, and you'll have a better chance at getting the deal you want. Your ISO will also usually offer better terms than outside lenders. Did this article help you learn more about how to turn your portfolio into a machine that pumps out capital? Do you have a portfolio that you're looking to use right now for these sorts of purposes? Contact us and we'll show you the way. Being a sales agent is never a walk in the park. The experience certainly toughens you up, just as working in any kind of sales will. You have to be extremely persistent, flexible, and innovative. Many new sales agents find themselves humbled when they first enter the field and realize the true meaning of “easy money” for themselves. On top of all of the personal challenges, there is also a lot of competition in the industry, and it only increases more and more every day. To make matters more complex, you have to constantly stay up to date on new technological advances. This can mean a lot of things, since the industry is quite wide. For example, you may have to learn about new software for the back-end that serve the agent, or about new POS equipment for your merchants. You may even have to stay on top of specific new payment technologies. These rapid changes are actually an opportunity in disguise, however. You could say that the break-neck speed at which this technology is developing has divided the merchant service field into two camps: There are agents and ISOs who are jumping head first into emerging software, systems, and tools; and then there are companies that are dragging their feet, trying to pretend that the technology isn't there. You can probably sense who has a distinct long-term advantage here, and who might survive the rapid changes that are just on the horizon. Back in dinosaur times—around the 1990's or so—sales agents for merchant service companies had to peddle their wares the old-fashioned way, by visiting every merchant in person, selling them the physical equipment to process transactions, and writing everything by hand. Even today, there are agents who take this inefficient approach, even though there is not much value in it now. The only thing that is really important nowadays is the ability to give your merchant a good deal that is customized to accommodate all of his needs—and the the best way to do this is to leverage the power of new technology. At the heart of the merchant services industry, the most critical kind of technology is new payment systems. Customers demand has driven the need for a diverse array of payment options, including contactless payment. If a sales agent can't provide this to his merchant, then he is really selling his client short and making it difficult for the business to adapt into a long-term, future-proof plan. The goal of a sales agent should be to find the client a user-friendly and fast POS solution that will serve him for years. No merchant wants to take time away from his business to deal with upgrades and technical problems, and no sales agent in his right mind wants to jeopardize his residuals by offering his merchant something that will become instantly outdated. All of this may seem extremely obvious, but the truth is that the majority of sales agents out there aren't giving their customers future-proof solutions. They don't offer the latest payment methods, and are relying simply on what has worked in the past. This is increasingly becoming a problem because there is lots of competition from companies that are providing easier and cheaper solutions. Take for example Square, and how it has grown explosively among small business owners. This company, as well as emerging payment processing services such as those of Groupon and Amazon, offer online solutions, are extremely flexible, and are much easier to set up for merchants than traditional options. More and more merchants are just cutting out the middle man when they choose a cloud-based POS system, such as those that are based on existing tablet hardware. This removes the need for expensive equipment and for lengthy training courses. Most of all, many of these systems offer all-in-one solutions, so that merchants can greatly simplify and integrate both their offline and online sales activities. This is great news for merchants, but it certainly makes it more difficult for sales agents to find a place in the industry. Not only that, but these modern systems usually originate from companies that were born on the Internet, so they have a huge presence on the web, and a small-time sales agent would have an extremely hard time competing with that. Digital marketing is becoming more and more critical in this day and age. People now use the Internet more than just about any other resource to find the information they need, and this includes when they are looking to buy a service of some kind. Merchants are no different in this regard, and one of the most efficient ways to find new businesses that need merchant services is to cast ones net on the web and capture leads through search engines, contextual ads, or social media marketing. Companies that sell POS software have grown hugely, and this is largely due to their huge presence on the Internet, which gives them a major upper hand when they are competing against traditional ISOs. POS software companies are focused on the future and spend most of their efforts capturing leads that are already interested, which means they expend less effort finding prospects. In addition, they can offer all kinds of payment solutions for merchants. It's really no wonder that the industry is trending in this direction. The only way for sales agents to respond in this brave new world is to adapt. This isn't necessarily a bad thing, either. Yes, agents will have to stay updated and will have to re-learn their industry constantly, but new advances in technology has also opened the door to a multitude of tools that can be used to make the lives of agents easier. For example, new software for managing portfolios can make staying organized much more simple and paperless. There are also new and better methods for bundling services available, which makes it much easier to close deals with prospects. More and more POS software with apps and upgradeable features is emerging, and offering these kinds of dynamic solutions can make a sales agent extremely attractive to merchants. It really comes down to how willing an agent is to embrace new technology as it is born. Even better, new technology is making the application process many times more simple than it ever was. There is no longer a need to make applications by hand, and getting your merchant set up and ready to take payments from his customers can happen in the span of hours instead of days or weeks. Free apps now exist that allow sales agents to track the status of their accounts, get notifications about any issues, and stay in constant communication with their ISO. All an agent really needs to take advantage of this kind of software is a modern phone or tablet. Part of this emerging efficiency is a reduced need for sales agents to interface with merchants in person, of course. However, this kind of interaction will never go out of style completely, and giving merchants in-person attention when they really need it will give agents a competitive edge. Embracing the tech side of things and the human side of things are not mutually exclusive options, after all. In the end, though, a sustainable long-term plan for success in the world of payment processing must include new technology, and businesses who remain inflexible will be doomed to a slow death. One of the first things you are going to need to consider when you start your journey in the credit card processing business is what ISO you are going to work with. Whether you are planning to become a sales agent or an ISO yourself working under a larger company, it's important to examine all of your options. If you're not cautious, you might find yourself signing up for a bad deal or even getting scammed out of your residuals. So which is the best program to sign up with? Well, the short answer is that there is no “best” program for everyone. Each ISO is different, and so is each sales agent. Everyone has different goals, and so it's important to find a company that will be a good fit. Shaw Merchant Group is one of the best in the country and has relationships with many different processing banks, which allows them to be versatile with the kinds of businesses that they accept. Is Your Merchant High-Risk? No Problem! - Competition is a great thing for customers in a free market, but it certainly reduces profit margins for providers. One way that credit card processors can stand to increase their profits is to expand their range of customers and get into the so-called “high-risk” arena. Indeed, working with overseas customers or customers who run businesses in tobacco, alcohol, or adult industries can be a bit riskier, but the revenue can also be substantially higher. Many times, merchants who are seeking a high-risk account have already been rejected when applying for normal merchant accounts, and they will be more than happy to work with you. Signing up with Shaw Merchant Group, you don't have to turn away merchants in this extremely lucrative niche! How Much Can I Make? - Shaw Merchant Group offers residuals and splits that are similar to what you might encounter if you approach a large ISO directly. The draw here, though, is that Shaw Merchant Group allows you to work with many different processors, and greatly simplifies the processes of becoming an agent. You won't have to sign up with a dozen different ISOs just to have a decent amount of options. Contact Shaw Merchant Group today and get started! When you are selling POS solutions or looking for a partner company to work with, one of the major things that you will have to consider is whether you want to offer your customers free terminals or whether you want to offer them a leasing deal. As with so many other factors in this business, it really depends on the specific customer. You must spend some time examining their needs before you can decide which option to sell them. You will find that different merchants have different goals, as well as different amounts of capital that they can provide upfront. You might also notice that, more and more, merchants will expect that at least their basic, entry-level terminals will be free to use. Lots of newer, innovative merchant service companies have taken to lending free equipment to their customers, as well as supporting the hardware and software for free, so you will want to take this into consideration as well. Free Terminals - “Free” isn't exactly accurate here, since the merchant doesn't really keep the equipment. Basically, they are allowed by the service provider to borrow the POS terminal at no charge until they end their contract, and then the equipment is returned. You can think of this as being similar to how many broadband Internet companies loan routers or modems to their customers, which are then returned when the customer terminates their service. This is an easy option for many businesses, especially those that are just opening their doors, because it requires essentially no upfront cost. There are sometimes monthly fees tacked onto this option, such as the cost to insure the machine, but for the most part, the merchant pays a lot less than they would have if they opted to buy their own equipment. Since POS terminals can be expensive, this is not a bad option for you to suggest to very lean startups. Always make sure that a partner company that you are signing up with has some kind of free terminal plan, since a lot of merchants will want this. “Free” is also not a very hard sell, so you might find that it will be easier to close deals with a loaned terminal. Your job is first and foremost to sell your clients on the merchant account, and you will want to do everything in your power to make it easier for them to use it—that means making it easy for them to get the terminal that they need. Leasing Terminals - With the popularity of free terminals, this has sort of fallen out of favor as of late, but it still has a certain amount of relevancy. Some merchants want to have their own equipment, and this could be for a number of reasons. Most commonly, a merchant may simply want to be able to switch service providers without going through the arduous process of re-learning how to use a completely new terminal. Leasing terminals is not without its problems, however. Compared to simply buying a terminal outright, leasing one may actually be a raw deal for the merchant. Because they will be paying little by little for their equipment, they may not even notice that their money is trickling away over the course of months or years, and that they might end up paying five or ten times the market price for their POS system. It's nice to make small monthly payments, but as business owners, these merchants can't afford the delusion that those costs don't add up. On the other end of things, leasing equipment can make lots of money for an ISO and a sales agent. Just as those monthly fees add up for the merchant, they can add up for the agent, and leasing equipment can mean a handsome addition to ones residuals. The bigger question is, however, should you sell merchants on such an unfavorable deal? In general, the answer is no. Now, not all leasing deals are bad. Some equipment is actually quite cost-effective, especially modern, more simple POS systems that are based on popular mobile operating systems and touch interfaces. The leasing options from popular service providers are sometimes quite fair. However, there are still a lot of merchant service companies in existence that use these tactics to rip off potential merchants, and it's best that you avoid associating with them. Your goal should be to build a long-term, sustainable relationship with your merchants. After all, this is what is going to give you sustainable, long-term residuals month after month. Being honestly concerned with your merchant's problems and offering them the best solution is also what will get you repeat business whenever it is time for them to buy added value products and services. You will want to cultivate trust, and it is difficult for a merchant to trust you if they feel that you have been trying to take them for all they have right from the beginning. That being said, there is nothing wrong with selling a fair leasing option to a merchant if that is what they honestly want. By all means, listen carefully to the client's needs, and if you feel that leasing a terminal is a better fit than providing one for free, then give them what they need. Regardless of what option you ultimately decide to give to your merchants, remember that no terminal is the least bit useful if your clients don't know how to use it. Make sure to partner with a company that not only offers various terminal options for your clients, but that has great training material and customer service to get your customers up to speed. After all, the sooner they are using your terminals to take in revenue, the sooner both you and the merchant service company can start seeing a new income stream. Make sure that your clients get what they need from the beginning, and you will be rewarded with few complaints, a strong reputation, and a consistent stream of residuals trickling into your bank account every month. Imagine someone who is running a business in a field that many consider to be “dubious” or risky, such as tobacco sales, debt collection, adult entertainment, gambling, or even travel and time shares. They may seem like everyday staples of a free market, but many payment processors won't touch these kinds of merchants with a ten-foot poll. They are known as “high risk.” A business like this might find that it is unusually hard to get a merchant account, but they still need to be able to take people's money and perform cashless transactions just like anybody else. Where do they turn when no one seems to want to work with them? This is where you come in. One strategy that you can take as a sales agent is to find a partner that allows you to cater to these high risk groups that might have a hard time attaining processing services for reasonable rates. You can even focus on this niche exclusively and strike some very lucrative deals because these higher risk businesses are usually willing to pay more. Many times, businesses like these may also have a high sales volume, which can make you a lot of money in residuals over time, even if you might have to take a smaller cut. - The business deals in goods of high price, where each individual transaction is hundreds or thousands of dollars. Some businesses just sell expensive items, and the added risk of charge-back means that credit card companies are less excited to work with them. - The business sells goods or services to customers in certain high-risk countries. Sure, not everyone in these countries is a scammer, but if a particular territory is known to breed fraudsters, then companies aren't going to be keen on working with them. - The business uses dubious sales practices, such as employing high-pressure sales tactics to sell people things that they don't really need or want; e.g. time shares, travel packages. There is a huge problem here with charge-backs if your customers are likely to have buyer's remorse. - The business deals in what some consider morally questionable goods and services. Again, as with businesses in certain physical territories, credit card companies like to avoid businesses that reside in certain moral territories. You might find that gambling businesses, strip bars, or cigar shops fall into these categories—basically, anything that deals in the vices. - The business performs transactions where the physical card isn't present. Basically, this takes a lot of ecommerce businesses out of the running for low-risk accounts. A lot of credit card fraud can take place online, and of course the charge-backs that result from fraudulent transactions can be costly. Now you might realize that it all really comes down to charge-backs. If the processor believes that there's a non-trivial chance that the activities of the business will result in a lot of charge-backs, or that the merchant may not fulfill their responsibility to pay for the charge-backs, then it may be considered high risk. Many processors will not deal with high risk merchant accounts at all, and in fact merchants in high risk businesses may have to work with specialized processors, and they may even have to set up their merchant accounts with over-seas companies. - Less competition. Other merchant services companies or sales agents may be (understandably) hesitant to work with these companies, so you might be able to pick up the slack. Yes, these accounts are riskier, but sometimes the risk can be worth the reward. Merchant service providers can mitigate some of that risk as well by raising their transaction costs or requiring a deposit. - Online sales are booming. People are buying goods online more than ever, and that means that someone is going to have to provide all of these online retail businesses with merchant accounts. Why not get into a niche that is explosively growing? You will never be in want of merchants to turn into your customers. - Many high risk businesses are also very lucrative. If your clients are making a lot of sales, then you are getting a piece of that pie. This is especially true for businesses that sell people what are considered vices. As much as society may look down on these businesses, they also love to buy from them. - You can cater to all business types with few limits. If you only sell merchant services to low-risk businesses, then you cut out many potential niches that you could work in. By specifically offering high risk merchant accounts, you open yourself up to just about any business that you want to work with. Never turn away another merchant simply because they don't fit the narrow definition of what a low-risk account entails. As with anything in business, of course, there are risks as well as benefits—that's why they call these high risk accounts. As a sales agent, you wouldn't be responsible for charge-backs, but you might be faced with making a smaller cut in terms of both residuals and any upfront payments for each merchant account that you sell. This is natural considering that the processor will have to more likely deal with charge-backs, so their fees will be on the expensive side. Still, by finding a partner that will allow you to take high risk merchants, you can add a more diverse variety of merchants to your portfolio, which will make your business more well-rounded. How Your Schedule A Works | How Much Can You Make Selling Merchant Services? When you're new to selling merchant services, lots of things can get confusing, but one of the most confusing things that you will have to deal with is understanding all of the statements that affect your residuals, and especially the fee schedules that determine your costs. Many times, this can be so cryptic that your partner company may actually spend some time and effort explaining the fees to you. At the very least, they should provide you with some kind of written material that demystifies things. Even still, things might not always be totally clear. Authorization and Capture / Settlement Per Item Fee - A key part of your Schedule A, you'll want to pay close attention to this section specifically. These fees are associated with the front-end platform. Should the processor that you work with offer more than one front-end, this section might look a bit different, as they may break everything down further and have different costs listed for different front-ends. First and foremost, you need to have your Schedule A on hand, so make sure that you ask your payment processor or merchant services provider for a copy. After that, you're going to have to figure out whether these three fees are depicted as one entire line or if they are broken down. Depending on your provider, they may be expressed differently. For example, you might find an “Authorization” line with a fee listed as $0.02, and that might seem uncommonly generous, but then there will be a “Capture” line that lists a fee of $0.07, and then a “Settlement” fee of $0.01, bringing the fees up to a total of $0.10. Other times, things will be combined already; for another example, you might see a line that reads “Authorize and Capture” with a fee of $0.06, and below that a “Settlement” fee of $0.02, making the total front-end transaction cost $0.08. Since this is kind of complicated, you usually won't bother to break things down for merchants. As you explain things to them, just tell them about the total transaction fee and don't have them worry about the details. For you personally, though, these broken down fees will mean a lot more because they can certainly affect your residuals. To illustrate how your fees can make a huge difference in your profit margin, let's say you have a portfolio of 100 merchants and, on average, they perform 500 transactions per month per merchant. Now, let's say that you charge $0.10 for your transaction fee. With 50,000 transactions, that means you are grossing $5,000 in revenue every month. How much of that will you keep? Well, if you're being charged $0.05 total per item by your processor, then your margins are 50%, and you take home $2,500. However, if your fees per item are $0.08, then you're only making $1,000 per month in profit. That's quite a difference. As you can see, your profit margins will depend largely on your fees, so you need to stay on top of them. More than likely, your processor will have this fee on the Schedule A. Almost all of them do, so be sure to look at this section for how much you are being charged and pass the cost onto your merchant accordingly. As another example, your processor might charge $0.07 per batch (your cost), and you might decide to charge your merchant $0.25 per batch (your revenue). In this case, you're making $0.18 in profit whenever that terminal is settled at the end of the day. Bank Identification Number (BIN) Sponsorship - You might find this section expressed a few different ways. All this really means is that your processor is keeping a tiny percentage of the profits (measured usually in a few basis points) before they give you your share. In case you were wondering what a basis point is, it's just 1% of 1%, or 1/100th of 1/100th (1%) if you want to break it down. So for instance, let's say your merchant processes $20,000. If the BIN sponsorship fee is 5 basis points, then your processor is keeping $10.00 before giving you your share of the profit. Now, there are definitely more items on your Schedule A than just these, but they're the key lines that you should keep a close eye on, and they're the basic items that you will find with most processors. For information about other sections that may appear on your Schedule A, you should ask your processor for an explanation. In essence, these three line items are important because they are what is going to determine how much you charge your merchant. As with any business, you're going to have to deal with costs compared to your revenue, which is what determines profit—and the fees are basically your cost. You're going to use your Schedule A as a detailed list of your costs, and from there you can come up with a fair and profitable fee schedule for your merchants. That difference between revenue (the fees your merchant pays) and cost (the fees your processor charges) every month is what will give you your residuals.